SANTA MONICA, CA (January 24, 2014) - The blockbuster second film of The Hunger Games franchise that took the world by storm ignites once again when The Hunger Games: Catching Fire arrives on Blu-ray Combo Pack (plus DVD and Digital HD UltraViolet), DVD (plus Digital UltraViolet), Digital HD, Video on Demand and Pay-Per-View Friday, March 7 from Lionsgate (NYSE: LGF). Academy Award(R) winning Best Actress Jennifer Lawrence (2012's Silver Linings Playbook) headlines the all-star cast in this action-adventure which became the #1 movie of 2013 and the 12th highest-grossing film of all time at the domestic box office. The first film with a female lead to top the annual box office since 1973, the film has grossed nearly $420 million at the North American box office and over $850 million worldwide to date. The second installment of the worldwide phenomenon is packed with over two hours of extensive, must-see bonus materials that include a Blu-ray-exclusive behind-the-scenes look at the making of the film, "Surviving the Game: Making Catching Fire," deleted scenes, an audio commentary with director Francis Lawrence and producer Nina Jacobson as well as a sneak peek at the highly-anticipated theatrical action film Divergent from Lionsgate's Summit label. The Blu-ray Combo Pack and DVD will be available for the suggested retail price of $39.99 and $29.95, respectively. 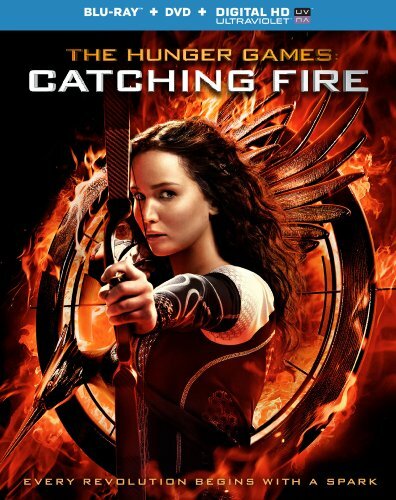 Hailed as "a monumental achievement" (The Playlist), The Hunger Games: Catching Fire features a critically-acclaimed cast including Lawrence, Josh Hutcherson (The Kids Are All Right), Liam Hemsworth (The Expendables 2), Academy Award(R) nominee Woody Harrelson (The People vs Larry Flynt, 1996), Emmy(R) nominee Elizabeth Banks (TV's "30 Rock"), Lenny Kravitz (Precious), Academy Award(R) nominee Stanley Tucci (The Lovely Bones, 2009) and Golden Globe(R) winner Donald Sutherland (Path to War), reprising their original roles from The Hunger Games. The impressive line-up is joined by Academy Award(R) winner Philip Seymour Hoffman (Capote, 2005), Jeffrey Wright (Codeblack Films' The Inevitable Defeat of Mister & Pete), Jena Malone (Into The Wild), Amanda Plummer (Pulp Fiction) and Sam Claflin (Snow White and the Huntsman). Based on the best-selling second novel of Suzanne Collins' award-winning trilogy, with a screenplay by Simon Beaufoy and Michael DeBruyn and directed by Francis Lawrence (I Am Legend), The Hunger Games: Catching Fire begins as, against all odds, Katniss and her fellow tribute Peeta have returned home after surviving The Hunger Games. Winning means they must turn around, leaving their loved ones behind and embark on a "Victory Tour" through the districts. Along the way, Katniss senses a rebellion simmering - one that she and Peeta may have sparked. At the end of the Victory Tour, President Snow announces a deadly 75th Hunger Games that could change Panem forever. Title Copyright: The Hunger Games (c) 2013, Artwork & Supplementary Materials (TM) & (c) 2014 Lions Gate Entertainment Inc. All Rights Reserved. Rating: PG-13 for intense sequences of violence and action, some frightening images, thematic elements, a suggestive situation and language. Lionsgate is a leading global entertainment company with a strong and diversified presence in motion picture production and distribution, television programming and syndication, home entertainment, family entertainment, digital distribution, new channel platforms and international distribution and sales. Lionsgate currently has more than 30 television shows on 20 networks spanning its primetime production, distribution and syndication businesses, including such critically-acclaimed hits as the multiple Emmy Award-winning Mad Men and Nurse Jackie, the comedy Anger Management, the network series Nashville, the syndication success The Wendy Williams Show and the critically-acclaimed new series Orange is the New Black. Its feature film business has been fueled by such recent successes as the blockbuster first and second installments of The Hunger Games franchise, The Twilight Saga Breaking Dawn - Part 2, Now You See Me, Kevin Hart: Let Me Explain, Warm Bodies, The Expendables 2, The Possession, Sinister, Arbitrage, Mud and Pantelion Films' breakout hit Instructions Not Included, the highest-grossing Spanish-language film ever released in the U.S.